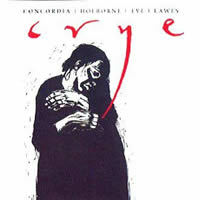 “Crye.” Anthony HOLBORNE: Pavana Ploravit (1599); The teares of the Muses (1599). Christopher TYE: Crye; Rachell’s Weepinge. Richard SUMARTE: Lachrimae. Tobias HUME: Captain Hume’s Lamentations (1607); I am melancholy (1605). Henry STONINGS: Miserere. Thomas TALLIS: Felix namque (1564). Robert JOHNSON: A knell of Johnson. Thomas WEELKES: Lachrimae Pavan. William LAWES: Consort set in C minor (rec. 1997). Concordia: Mark Levy, Joanna Levine, Catherine Finnis, Jonathan Manson, Emilia Benjamin (viols); Gary Cooper (virginals, org). Metronome MET CD 1020 (http://www.metronome.co.uk/). A tour of the English viol consort’s heyday wasn’t news in 1997. This one works because it highlights some rarities and includes a folio of poetry and art (and Metronome keeps it active). Levy’s program is smart. With its stabbing, repeated figures, Crye refers to street vendors rather than the prevailing sadness, and Holborne’s items make a pavan-galliard pair. John Dowland casts a long shadow from the wings: Holborne and Lawes open pavans with the Lachrimae Pavan’s signature phrase, and Sumarte puts it entire on a plucked solo viol — now a large, mellow lute. In contrast, Hume’s awkward air is as unsettling as a passerby’s fixation. A knell of Johnson creeps, then jogs, and finally whirls like a top, and Miserere (by the obscure Henry Stonings) boasts quick steps and flowing counterpoint. We need to end on William Lawes, whose unstable harmonies and odd melodic contours would seem to prefigure the Puritan / Royalist disaster on the horizon. Upon hearing the In Nomine Rachell’s Weepinge, poet Glyn Maxwell came to contribute a narrative poem placing her in the Civil War. (The music title speaks of Jeremiah 31:15.) Käthe Kollwitz’s 1922-23 woodcuts of war victims provide a subtext between the poem’s nine sections. Concordia’s way is more inward than Fretwork, less propulsive than Phantasm. Ensemble and tuning are precise. (I wish they recorded more often!) See W.A. Grieve-Smith’s piece on their first Gibbons album. Under “Concordia viols,” YouTube lists four videos. François COUPERIN: Leçons de ténèbres (1713-14); Quatre Versets (1703) (rec. 1996). Sophie Daneman, Patricia Petibon (sops), Anne-Marie Lasla (bass viol), Les Arts Florissants, William Christie (hpsi after Francis Blanchet, 1736; dir.). Erato 0630-17067-2 (http://www.warnerclassicsandjazz.com/). The other days never got published and the scores were lost. What we have belongs in the line of Lambert (1663, 1689) and Charpentier (many, 1670-92), but Couperin’s chromatic harmonies and intimacy make special claims. The mandated text (Lamentations 1:1-14) is never an obstacle to the musical flow, which sends its limpid forces (one or two sopranos, harpsichord or organ, bass viol) across a varied expressive palette. A letter of the Hebrew alphabet, inscribed with ornamental curves by the singer, introduces each verse (recalling a Palestrina practice). The fiery rhetoric (“she dwelleth among the heathen, she findeth no rest”) gains under Couperin’s restraint, cool but sensuous. All three Leçons close with the same plea (“Jerusalem, Jerusalem, return to the Lord thy God”) but it’s treated in singular fashion each time. Christie has this highly coded style in his bloodstream. The vocalists are well-matched (in the Troisième Leçon), with Patricia Petibon the more attractive — a pure tone, tight trills, deliciously pointed phrasing; honors are evenly divided in the solo Leçons. Pronunciation of Latin is of course à la française. 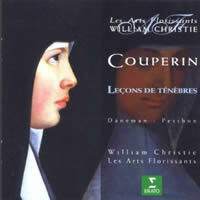 It’s possible to find this CD too extroverted for “the nuns at Longchamp,” but the convent was renowned for its music and “people of quality” regularly attended services there. The Paris opera houses closed for Passion week, and star singers would perform such items in churches, for which admission was charged. The divas were hidden behind black curtains but would peek out to reassure their fans.